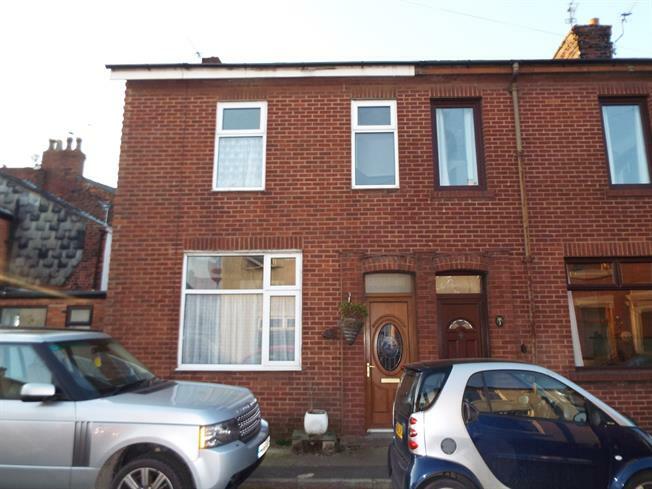 3 Bedroom End of Terrace House For Sale in Preston for Offers Over £80,000. This property's price has dropped from £90,000 to Offers Over £80,000. OPEN HOUSE EVENT10,000 REDUCTIONSAT 27th APRIL BETWEEN 2PM & 3PM Call to arrange your viewing slotNO CHAIN Traditional end terrace house in need of modernisation, vestibule, generously sized lounge with stone built fireplace housing gas fire, fitted kitchen, utility room, three bedrooms to the first floor, four piece white family bathroom suite, rear yard, ideal Investor Opportunity or First Time Buyer Purchase.. Generously sized lounge with the focal point being a stone built fireplace housing gas fire. Wood beam ceiling. Two feature alcoves. Wall light points. Double glazed window to the front elevation. Door leads to kitchen. A range of wall and base units with wooden worktops. Inset stainless steel single drainer sink unit. Gas cooker point Wall mounted multi-point hot water boiler. Wood beam ceiling. Part tiled walls. Stairs lead to the first floor accommodation. Under stairs storage cupboard. Double glazed window to the rear elevation. Master bedroom with double glazed window to the front elevation. Four piece white family bathroom suite consisting of step-in fully tiled shower cubicle housing shower, panelled bath, pedestal wash hand basin and low level WC. Part tiled walls and vinyl floor. Double glazed window to the side.